Parliaments are the cornerstone of representative democracy and one of the most significant loci of democratic politics. A growing number of studies have focused on the effects of ICTs on parliamentary function, but there is still a lack of systematic empirical research which measures change overtime. This chapter attempts to fill this gap by studying the extent and nature of change in ICT use by the parliaments of Southern Europe, focusing on whether parliaments have moved significantly forward toward opening up their digital gates to concerned citizens. To this end, comparative website analysis is deployed to track the use of ICTs by the legislatures in Greece, Cyprus, Italy, Spain, Portugal, as well as the legislature of the European Union, at three different time instances, namely 2004, 2011, and 2013. Change is measured using the ‘E-Legislature Index’ and its four dimensions: Information provision, Bilateral interactivity, Multilateral interactivity, and User-friendliness. The study’s findings show that ICT use by parliaments is characterized by volatility and discontinuity rather than continuous linear growth. 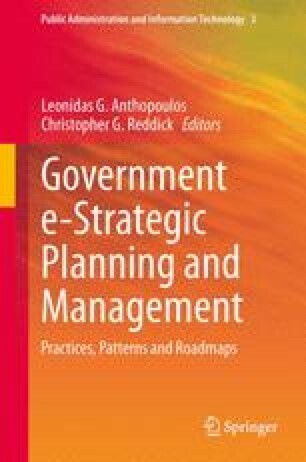 Furthermore, the analysis reveals that e-government and e-governance follow different trajectories: whereas ‘Information Provision’ follows a steady but expected progress and ‘Bilateral Interactivity’ shows an upward but unsteady trend, ‘Multilateral Interactivity’ fluctuates between stagnation and retrogression, pointing to a tendency of the parliaments to avoid taking greater risk of opening up their practices to citizens. In light of these findings, ICT use by parliaments is evaluated from the perspective of ICT strategic planning, providing suggestions for future research in the field. 1. Is there a general introduction/overview of the Chamber? 2. Does it have a weekly newsletter/bulletin? 3. Does website provide an online virtual tour/panorama of the parliament/senate? 4. Is there a ‘what is new’ or a ‘what is on’ section? 5. Can you see when the site was last updated? 7. Are there any statistics regarding the number of hits of the website? 9. Is there a link to other, devolved or regional, assemblies? 10. Is there a link to the European Parliament? 11. Are there links to other legislatures? 12. Is there a press (or media) section? 13. Is there a ‘recreational’ section (e.g. games, quizzes)? 1. Is there a guide (e.g. factsheet or summary) on the role of members? 2. Is there a list of members? 3. Is there a list by constituency? 4. Is there a list by political group? 5. Is there a list by gender? 6. Does it include biographies? 7. If so does this apply to the majority of members? 8. Does it include email addresses? 9. If so do most members have an email? 10. Does it include links to personal website? 11. If so do most members have a personal website? 12. Does it include interventions from members? 13. If so does this apply to interventions from most members? 14. Can you find out how members have voted on particular issues? 15. Can you find out general information about the pay and conditions of members? 1. Is there a guide (e.g. factsheet or summary) on the role of committees? 2. Is there a list of committees? 3. Is there a list of members of committees? 4. Is there a list of committee publications/reports? 5. Is there a timetable for future committee meetings? 6. Are there any contact details? 7. Is there an audio link to committees? 8. Is there a video link to committees? 1. Is there a guide (e.g. factsheet or summary) to the legislative process? 2. Is there a list of pending or ongoing legislation? 3. Is there an index list of pending or ongoing legislation (e.g. alphabetical or thematic)? 4. Is there a search facility for pending or ongoing legislation? 5. Is there a list of legislation passed? 7. Is there a search facility for legislation passed? 1. Is there a Parliament/Senate debates schedule? 2. Is there a facility for accessing online the full text of debates? 4. Is there an Audio facility to listen to debates? 6. Is there a facility to watch live video of debates? 1. Is there a ‘contact information’ section? 2. Is there an email link to webmaster/web content manager? 3. Is there any facility to receive news and latest information through registration of email address (e.g. subscription)? 1. Are there any guidelines for submitting feedback or enquiries? 2. Is there a facility for notifying webmaster of website problems? 3. Is there a facility for commenting on the website? 4. Is there a link to an office or responsible official for making general (e.g. political) enquiries? 5. Can feedback on issues be given online? 6. Can citizens suggest new discussion/issue? 7. Is there a link to an Ombudsman (official/office that investigates complaints from members of the public about government)? 1. Are there any online opinion polls? 2. Is there any attempt to link with other consultation exercises outside the Parliament/Senate? 3. Is there an online forum? 5. Are any of the online forums archived? 7. Is there any attempt to link with other discussion groups outside the Parliament/Senate? 1. Is there a FAQ (Frequently asked questions) section? 2. Is there a general search facility? 3. Are there separate search facilities for specific sections of the site? 4. Is there a site map? 5. Is there a content index? 6. Is there an A–Z index? 8. Did you come across any dead links? 9. If so how many? 10. Is there any information or special facility for difficult to reach groups such as children? 11. Is there a text only version of the website? 12. Is there a ‘help’ or ‘how to use website’ section? 13. Is there information in any other language? Global Centre for Information and Communication Technologies. (2012). World e-parliament report. http://www.ictparliament.org/WePReport2012. Accessed 3 March 2013. Inter-Parliamentary Union. (2009). Guidelines for parliamentary websites. http://www.ictparliament.org/node/691. Accessed 3 March 2013. Smith, C., & Webster, W. R. (2007). The emergent ICT culture of parliamentarians: the case of the Scottish Parliament. Paper presented at the European group of public administration annual conference, study group on egovernment: information and communications technologies in public administration, Madrid, September. http://researchrepository.napier.ac.uk/3446/1/Smith_and_Webster_EGPA_07_Paper%5B1%5D.pdf. Accessed 3 March 2013. Trechsel, A., Kies, R., Mendez, F., & Schmitter, P. (2004). Evaluation of the use of new technologies in order to facilitate democracy in Europe. http://www.erepresentative.org/docs/6_Main_Report_eDemocracy-inEurope-2004.pdf. Accessed 3 March 2013. Weeks, R.V., & Lessing, N. (2001). Convergence of emerging information technology and business practice in the digital economy. South African Journal of Information Management, 3(3/4). http://www.sajim.co.za/index.php/SAJIM/article/viewFile/140/137. Accessed 3 March 2013.